Assamualaikum and ramadan mubarak to all Muslims particularly my Muslim friends. I am posting here this recipe due to to a friend's request. 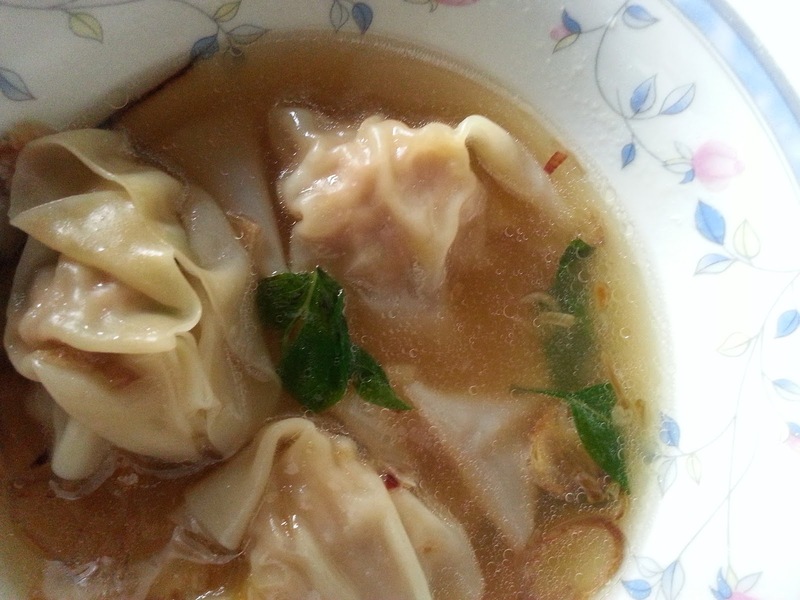 She says this style of cooking is not the typical wantan and it's refreshing. This is the most fuss-free wantan I have ever made and it is good for berbuka and sahur, and of course way after Ramadan. I say fuss-free because when I made these I only had minced chicken and wantan skins. I did not even have carrots or water chestnuts or Japanese mushrooms which I would normally add to my minced chicken if I make wantans. For greens, I asked my daughter to go to the garden and pick me some Thai basil and you can also use the sweet basil. FYI, it's very easy to grow basil, I bought some from the night market and planted the basil stalks in soil and watered them every day. The same goes for mint leaves and daun kesom. However, mint leaves always die on me. In the end I bought a pot from the nursery. They seem to be surviving. So now I have mint leaves in my garden as well. I marinated the chicken with olive oil, light soya sauce and oyster sauce, pepper, a little ginger powder (optional) and corn flour. To make the soup, I simply boiled water, enough to cover the number of wantans I'd like to eat. While the water is boiling, I took a fat pinch of chicken, placed it in the middle of the wantan skin, added a basil leave and pushed the skin inward to close. I made about 9 fat ones and kept the rest for next time. Then I just dump the chicken wantans into the boiling water. And some basil leaves. I seasoned the soup with a little oyster sauce, fish sauce and pepper. The moment the meat is cooked (you can see the white through the wantan skin), turn off the heat and serve. Super easy and super fuss-free. There is a bunch of Clipping Path Service Provider in the world market. But the difference with us is we have a huge bunch of professional team, Each of our has a minimum 5 year to 12 years experience in this clipping path service provider sector. You can visit our site to see our working quality.